In 2006 we introduced unlimited surveys/responses, and the rest of the industry followed suit. Today we are proud to be the first comprehensive panel-management tool to offer UNLIMITED panelists. No per-user fees. No limits. This is our commitment to scale and technology. We already offer unlimited surveys and responses as part of the Survey Analytics survey platform. 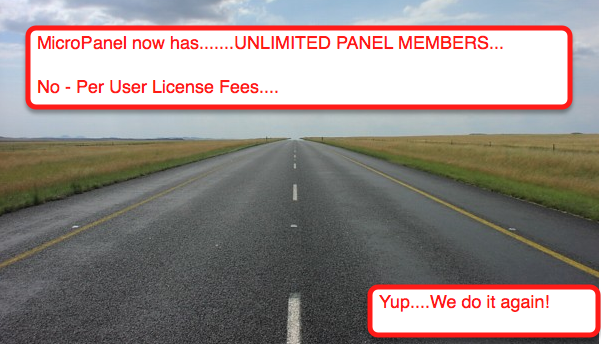 We've now decided to offer MicroPanel, our Panel Management Platform, also for a fixed license fee for unlimited panelists. This means you can have a one million strong research panel, and you don't have to break your budget. You pay a fixed fee for each panel you create and run! The Fine Print: OK, we realize that we are pushing envelopes here - so we are only offering this through the end of this year - Dec 31st. Early next year, we'll take a look at how users adopt this pricing model and then we'll make a decision to continue or change our pricing model. Rest assured, if you are already in the unlimited plan, you'll be grandfathered in, of course! OK - What is Unique about MicroPanel? We are very excited about piloting a new offering -- we have an integrated model for actually delivering panelists also! Not only can you build and manage your panel from a software standpoint, we also have the ability to hydrate your panel with panelists. We can essentially do the recruiting for you! If you are an existing customer of Survey Analytics - get in touch with your Account Manager. If you are a new customer, get in touch with our sales team to get a demo of MicroPanel.